The ISO/IEC 27001 standard provides a benchmark at international level to certify Information Security Management Systems (ISMS). The auditing process carried out by the OCG ensures that the system complies with the regulations and subsequently certifies the conformity with the standard. 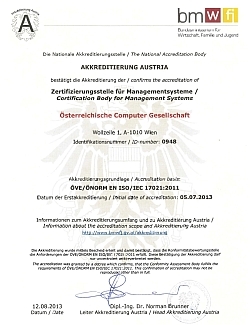 In March 2012 the OCG successfully completed the audit required by the Federal Ministry of Economy, Family and Youth. The required audit of a pilot customer had been carried out successfully in early 2013 and the initial accreditation was granted on 5 July 2013. As the OCG is an independent association, it is especially suited to be a certification body. The OCG has already gained a lot of experience in personal certification (more than 400,000 issued certificates) since 1997. There are many members of the OCG network who contribute their expert knowledge to the field of information security. 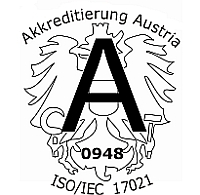 These specialists have the necessary competence to carry out professional and high quality audits and certifications according to ISO/IEC 27001. The OCG is objective, unbiased and independent. At the same time it has intensive contacts to science, research and education, administration and economy. All this makes sure that you get high quality audit results at a reasonable cost-benefit ratio so that you can benefit from the certification for a long time. The ISO/IEC 27001 standard certification proves to the customer and the public that the certified company has implemented an effective information security management system. Spectacular cases of deficiencies and their dramatic consequences have increased our awareness of security matters. Business partners are asking companies to prove their compliance with security standards before they consider them as partners. Information security has become a crucial factor for success. Private customers and consumers also expect secure handling of their data according to the latest state of the art.